Have you ever cooked with or otherwise used thyme? If you enjoy herbal flavors but haven't given this particular one a chance, drop everything you're doing and go to the store. Thyme is a fantastic complement to many different fruits. It's likewise magical in soups and just about anything roasted. Within the realm of cocktails, I tend to use thyme alongside pear and apple flavors. The results never disappoint. This cocktail, apart from paying homage to the Madeleine L'Engle novel that got me started on science fiction (5 points if you got that reference), combines thyme, pear, gin and bitter lemon with dangerously drinkable ratios. Pear is a tricky fruit to work with raw, so I tend to buy natural pear juices/nectars to make my life easier. If you have a juicer, you can reap the extra health benefits of homemade fresh pear juice (fiber, vitamins and minerals galore). I chose to use gin as the spirit as it's always beautifully elevated when paired with fresh herbs and botanicals. If you're curious about which types of gin I tend to favor, I highly recommend trying Koval Dry Gin (local to Chicago) or any variety of St. George gin (CA). St. George is especially great for narrowing down the botanical mix you prefer (spice, floral, or earthy notes). To add some natural fizz with a twist, I topped the cocktail with Seasons Soda Bitter Lemon Tonic. This soda is local to Chicago and features a blend of maple, orange blossom honey, aromatics and bitters. I loved that it heightened the complexity of the cocktail rather than watering it down. Plus, no refined sugars or preservatives! If you're feeling extra fancy when you make this one, you can garnish with a lemon peel spiral and a thyme sprig as shown in the photos. I prefer to make my spirals using a channel knife - starting at the top of the lemon, I trail the channel knife in a spiral path, maintaining constant pressure. You may need to physically twist the peel into a spiral after you separate it from the lemon. I also find that lemons with thicker peels lead to better spirals due to the relative rigidity of the skin. Shake first three ingredients with ice until chilled. Strain into rocks glass over a large ice cubic or spherical ice cube. Top with soda and garnish. Enjoy while discussing the implications of time travel with your nerdy friends. *To make syrup, heat 4:1 parts water:sugar in a small saucepan until sugar dissolves. Add thyme and keep on heat for 5 minutes, making sure thyme is fully submerged. Strain, allow to cool and store excess in the fridge for up to 3 weeks. If there's one lesson I learned about mixing for parties, it's to choose 1-2 cocktails and create them in bulk to accommodate your guest count. 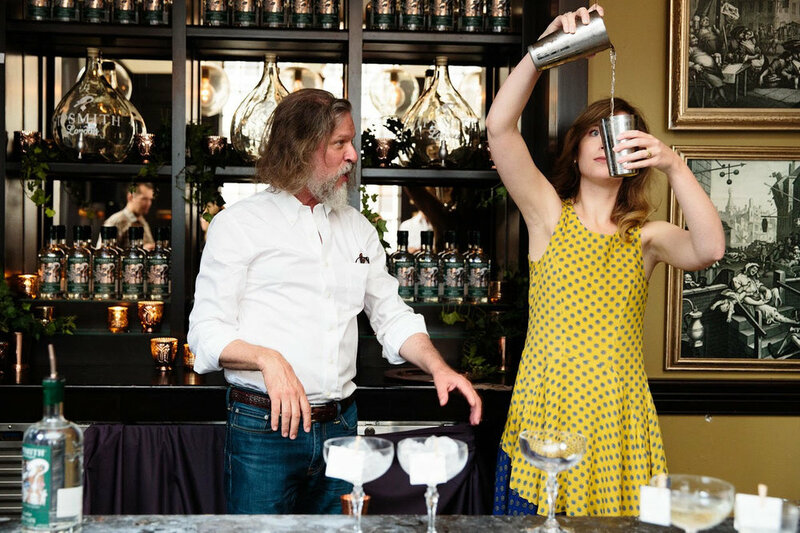 My cocktail journey started with making drinks for my friends on big events like New Year's Eve, graduation and, you know, the occasional Thursday night in college. I loved focusing on the process and making sure everyone got a beverage that fit their palette, but I found that I had very little time to partake in the festivities myself. Granted, sometimes mixing one drink at a time is a nice escape from a large party - you focus on something you love while people come to you and chitchat when they're ready for another drink. You also get to look after everyone's levels of drunkenness and make sure they're getting water if they need it. It all depends on the event and what role you're looking to play. Last weekend, Will and I traveled back to Minnesota for the annual O'Connor family Christmas, hosted by his parents. Socializing with his family is always a blast so I knew it would be best to whip up a large batch of Valcohol goodness and then sit back to enjoy the quality company. I had never before used a bowl for serving cocktails in bulk, but Will's mom discovered a beautiful punch bowl and glasses that had belonged to her grandmother, and so commenced operation Valcohol Holiday Punch. Mix with flavors that made me nostalgic for the holiday season. Given these considerations, I landed on the following general ingredients: vodka, apple, ginger, lemon and thyme. I highly recommend using Trader Joe's when you're looking for juices to mix with as they tend to have interesting flavor combinations and less sugary options than your typical grocery store. Another perk is that TJ's juice is usually way cheaper for the quality. For this cocktail, I chose their Honeycrisp Apple Cider because it actually tastes like apples and mixes wonderfully! TJ's also has great deals on ginger beer - they have Reed's brand available for cheaper than most grocery stores and their private label is just as good. 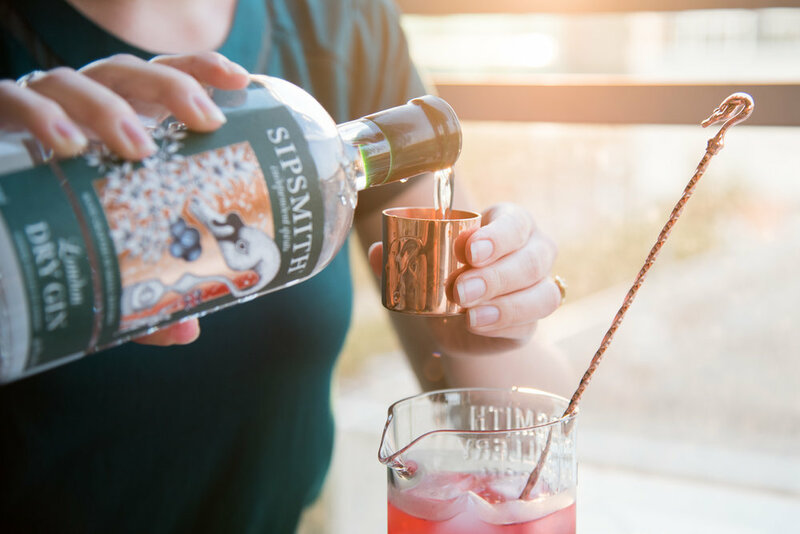 When it comes to vodka, you don't need anything fancy for something this flavorful - just a decent bottle that will mix well. I used Kirkland Signature brand from Costco which would roughly be on par with Absolut. Now let's talk ratios. When making a cocktail in bulk, I start with the ratios for a single cocktail, figure out roughly how many cocktails I expect to be consumed (1-2 per drinking adult is a good start) and then do some multiplication (I may or may not use Excel). The key is not to blindly trust your math. Always sample your creation before serving as you never know if it'll taste slightly different when made in bulk versus on the individual scale. Lucky for you, I've already done all the math for this punch and can tell you exactly what and how much to buy. All you need to do is mix it up and be the hero of your next holiday party! 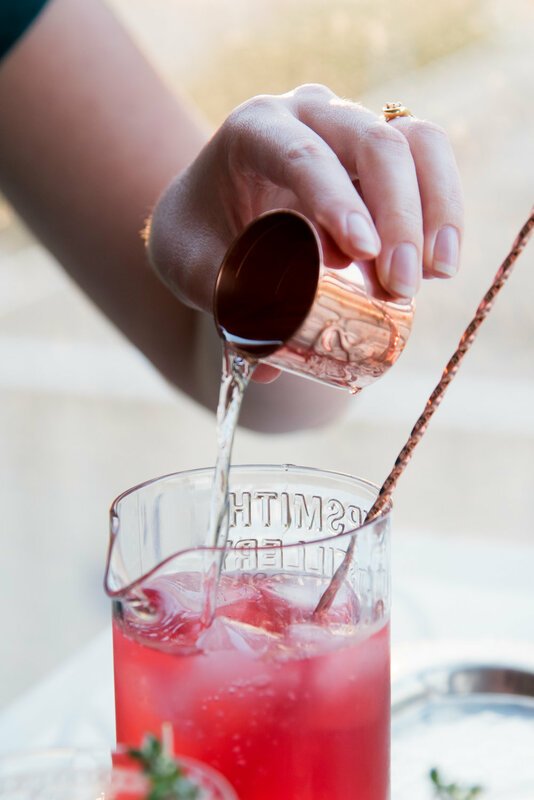 Mix all liquid ingredients (preferably chilled) in a large punch bowl (it may be a good idea to start with half the quantity to see if more will fit in your bowl or if you need to split it up between multiple containers). Prep punch glasses with a couple sprigs of fresh thyme. If you have an ice bucket, set that out for guests to use as they prefer, otherwise, also prep punch glasses with ice. Sit back and enjoy your party!